When Aamir was in his teens, someone suggested that his uncle Nasir Husain should cast his nephew sometime in the future. Akshay Manwani traces Aamir Khan's fascinating journey to stardom. 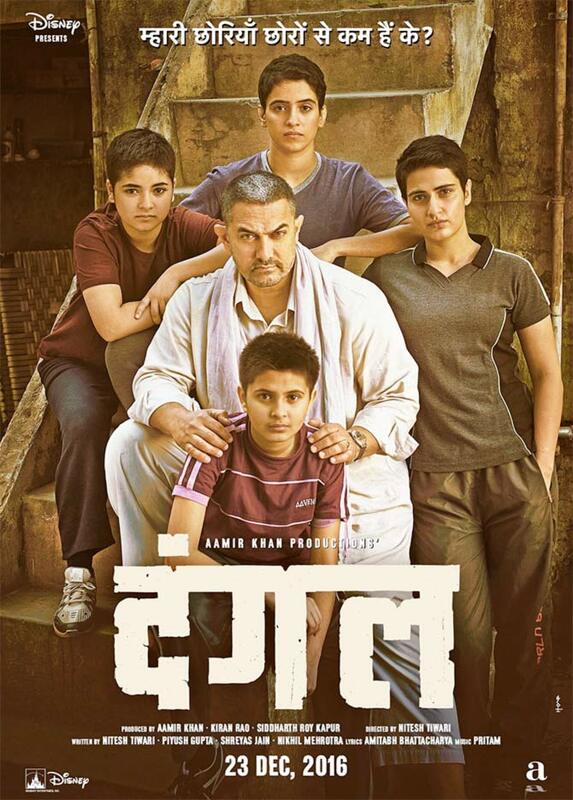 IMAGE: Aamir Khan's Dangal has wooed both the critics and the box office. Rashmi: Pata nahin humaari shakal kaisi lag rahi hai (I don't know how my face looks). Raj (smiling gently): Lekin yeh sab hua kaisey (But how did this happen)? Raj: Aur kahin chot lagi hai (Any other injuries)? Rashmi: Nahin. Dettol waali koi chot nahin (No. None that can be treated with Dettol). -- Rashmi (Juhi Chawla) and Raj (Aamir Khan) in Qayamat Se Qayamat Tak. IMAGE: Aamir Khan and Juhi Chawla in Qayamat Se Qayamat Tak. Ratan: Dekh, zyaada hoshiyaari mat dikha, haan (Listen, don't act smart)! Chal be Ghanshu, Ghodey, yahaan bahut garmi ho gayee hai, yaar. -- Ratan (Mamik Singh) and Sanjay Lal Sharma (Aamir Khan) in Jo Jeeta Wohi Sikandar. IMAGE: Aamir Khan and Mamik Singh in Jo Jeeta Wohi Sikandar. Among the more endearing moments from Yaadon Ki Baaraat is when the title track is rendered by the mother at the beginning of the film. While the mukhda of the song is being repeated, the youngest of the three children, dressed identically to his elder siblings, signals his intention to go to the toilet. He reappears, buttoning up his shorts, as the first antara is being sung (Badley na apna yeh...). The mother takes this boy, with his bow tie, his toothy smile and his neatly combed hair with a sharp left-parting, on her lap. The older two siblings gather around the mother and she extends her right arm to offer them similar love, but her youngest son, still seated comfortably on her lap, enjoys pride of place in her affections. IMAGE: A cute-as-a-button eight-year-old Aamir Khan in Yaadon Ki Baaraat. 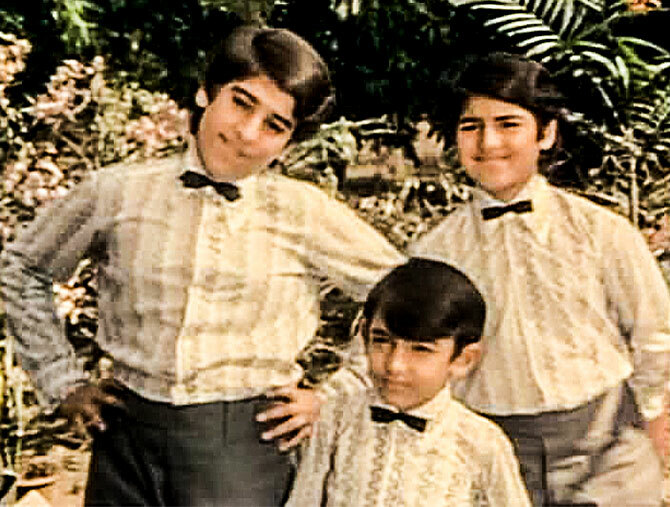 Aamir Khan, who played this youngest child, was only eight years old when Yaadon Ki Baaraat released in 1973. Nasir Husain had earlier cast his children Mansoor and Nuzhat as the young Mohan and Mona in Phir Wohi Dil Laya Hoon. The pair are also seen in the song Aaja Piya Tohe Pyaar Doon in Baharon Ke Sapne where they play the young Ram and Geeta. Continuing with this trend, Aamir was actually supposed to play the young Sunder in Pyar Ka Mausam. But that role eventually went to Aamir's younger sibling, Faisal Khan. Apparently, Aamir threw a fit on the day of the Pyar Ka Mausam shoot. 'So Faisal was brought in and he calmly gave all the shots,' said Aamir, chuckling. Consequently, Aamir's film debut happened only four years later in Yaadon Ki Baaraat. But this didn't mean that Husain was waiting to launch Aamir. On the contrary, Husain had discouraged his nephew from turning actor. IMAGE: Aamir Khan in Holi. 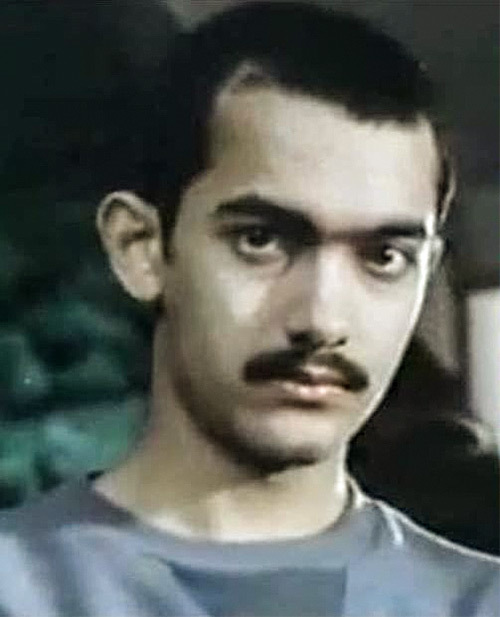 By the time Aamir had completed his twelfth standard, he was clear that he wanted a career in films. Aamir told Husain that he wanted to work in his films. This is how Aamir came to be an assistant director on Manzil Manzil and Zabardast. As an AD, Aamir impressed Husain with his work ethic. He introduced Husain to the concept of action continuity, which basically helped the filmmaker establish where exactly to pick up a scene in terms of its little nuances (what are the background artistes doing, etc) after the previous shot. 'He was the best AD ever,' admitted Nuzhat. Aamir is also seen in passing in a couple of sequences in Manzil Manzil. However, before he worked as an AD, Aamir had already acted in a short film called Paranoia, followed by a couple of student diploma films called Subah Subah and Young Törless. He also worked backstage in Gujarati theatre with Mahendra Joshi for a year-and-a-half. While Aamir was working as an AD with Husain, he got a call to act in Ketan Mehta's Holi (1984), which was under production. Husain agreed and Aamir went to Pune, shot for Holi and returned. Later, towards the end of Zabardast's shooting, which was under production in Khandala, Javed Akhtar happened to visit Husain at the Fariyas Hotel. Akhtar's remark may have been the tipping point in Husain making up his mind on casting his nephew since the filmmaker had been aware of Aamir's acting pursuits. 'It must have had some impact,' Aamir told me. But Aamir didn't bring up Akhtar's comment with Husain. The introduction surprised Aamir completely. 'Toing karkey main ruk gaya. (I was dumbstruck.) Where did that come from?' recalled Aamir of that pleasant moment. But even after this Aamir didn't follow up the matter with Husain. He thought Husain was 'joking'. Meanwhile, Zabardast released and didn't do well. It was after this that Husain called Aamir one day and said, '"I'm writing something, which I want you to act in." That film was Qayamat Se Qayamat Tak. Husain had started writing Qayamat Se Qayamat Tak with Sachin Bhowmick. But because Bhowmick and Husain appeared to have run out of ideas, Husain replaced Bhowmick and involved Aamir and Nuzhat to write the script along with him. The broad idea that Husain had was that he was writing a film for Aamir, which was a pure love story, but with a doomed ending. 'We were clear that it was going to be Romeo and Juliet,' Nuzhat confirmed to me. Husain was clearly going against the norm since action, vendetta films, with an overall coarseness in language, music and lyrics dominated the Hindi cinema landscape in the late 1980s. Meanwhile, Husain's illness forced him to turn to Mansoor to direct the film. Mansoor at this time was struggling with his own career. He had dropped out of engineering, having spent eighteen months at IIT-Bombay, a couple of years at Cornell and another eighteen months at MIT, 'all of which adds up to five years without getting a degree,' Mansoor told me self-deprecatingly. Having returned to India from the US in 1980, Mansoor assisted his dad on Zamaane Ko Dikhana Hai with the lighting, and then 'pretended' to assist him in Manzil Manzil. The one good thing that Mansoor did in this period was that he made a short film called Umberto. The film's central character is a 'bum', not unlike Sanjay Lal Sharma in Jo Jeeta Wohi Sikandar. When Husain saw Umberto, he liked it. 'I liked his picturisation of songs,' Husain told Nasreen Munni Kabir. 'He felt that I had some control over the storytelling medium,' Mansoor added. That's when Husain asked Mansoor to direct Qayamat Se Qayamat Tak. But Mansoor was uncertain. He was focused on making Jo Jeeta Wohi Sikandar, but was stuck with its writing. Additionally, for Mansoor, Husain's film was 'like looking through the same lens -- pehley yeh ho jaata hai, phir woh ho jaata hai... (full of coincidences)'. Husain, though, convinced Mansoor to listen to the screenplay. Mansoor's entry considerably changed the approach to Qayamat Se Qayamat Tak. Husain was now dealing with Nuzhat, Aamir and Mansoor, whose sensibilities were very much attuned to the voice of a younger generation. Husain frequently sparred with the three of them while writing QSQT's screenplay. 'He was like a tiger with us when he was arguing about the scenes,' recalled Aamir. One of the major sources of these creative conflicts between Husain and the next generation pertained to Qayamat Se Qayamat Tak's climax. Midway through the scripting, Husain wanted to change the climax to a happy ending. He thought that would be more palatable to the audiences. Husain was also probably haunted by Baharon Ke Sapne's tragic ending and that he had to change that in the wake of the film's underwhelming opening. His fears about the tragic ending found support amongst his friends, who belonged to his peer group. But Mansoor, Aamir and Nuzhat stood their ground. When Husain saw the final cut of the film, with Raj and Rashmi dying, he was convinced he had a 'hit' in his hands. Excerpted from Music, Masti, Modernity: The Cinema Of Nasir Husain by Akshay Manwani, with the permission of the publishers, HarperCollins India. After Dangal, watch Aamir's Toofan Aala!